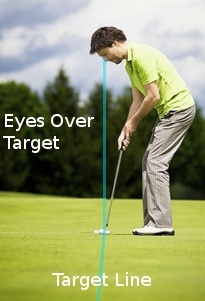 In this section you will find the best putting tips to help improve your golf game. No matter how far you hit your driver, how accurately you play iron shots, or how deftly you chip and pitch, golf is all about getting the ball in the hole. That means the shortest club in the bag – the putter, standard length 35” – plays an oversized role in determining your success. Statistics bear this out. Most golfers, including pros, use the putter for about 40% of all shots in a typical round. No other club comes close. If your average score is 90, you’ll take about 36 putts per 18 holes. For pros, the figures are closer to 70 and 28. Is the stat misleading? A little, since it counts tap-ins that require practically no skill to make. But the fact remains – if you want to shave strokes from your score, the green is the first place to go. Golf-Info-Guide.com’s Putting Tips, composed by experts and offered in text and video formats, cover every aspect of this delicate art-slash-science. Fundamental putting tips are treated with exacting detail: developing a proper grip; aligning your body, eyes and clubface; accelerating the putter through impact. We offer putting tips lessons on finer points, like reading the green’s break and putting on bumpy surfaces, and discuss alternatives to conventional putting methods (e.g., using a “no-peek” stroke or cross-handed grip). Having the right equipment is critical, too, and you’ll find advice on everything from belly and long putters to heavy clubheads to extra-thick grips. Of course, we also tackle the most common putting ailments, like deceleration, excessive wrist action and the dreaded “yips.” Finally, you’ll find numerous drills designed to improve your stroke path, tempo and more. Until you’re holing every putt inside 10 feet, lagging every long one close and going months without a three-putt, there are always strokes to be gained on the greens. The shortest distance between you and lower scores is 35” – and help is just a mouse click away at Golf-Info-Guide.com. 17. Can the Claw Grip Help My Putting? 95. Putting Stroke, A Long Swing or a Short Pop? 103. Should Putts Die In the Hole, Or Ram Into the Back? 104. Should You Lag Long Putts, or Try to Make Them? 105. Should You Try the Belly Putter? 121. Top 10 Putting Tips Ever! 140. When It Comes to Putting, The Eyes Have It.